For a creative, imaginative and perhaps, talkative, bunch of people. Great cover art - really captures the imagination. But, as the game forces you to do, how does one even begin to describe it? 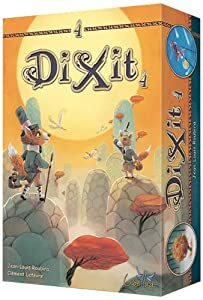 Meaning: Apparently Dixit is Latin for some word relating to "speak"
Price Range (AUD): $37 to $72 - good price is around $40 but even that is a bit expensive. You are basically paying for good artwork. Only necessary if you really love the game. They increase the number of cards you can play with. Make sure you do the proper research HERE before buying some of them - some of these smaller packs don't increase the number of players, just the number of cards. EDIT (August 2014): From my understanding, if you are new to the series, the SQUARE BOX STANDALONE version of Dixit Odyssey (shown below) is supposedly the best version to get because it lets you play with 12 people (providing 12 really cool-looking voting tracks which operate by pegs). The rectangular version (above) is an expansion, adding components to Dixit "vanilla" for 6 more players. The square box standalone could be harder to find now as the version above seems to have been released with the intention of phasing out the square box standalone. As many people have suggested though, you could create your own voting system if you just own the original Dixit and aren't willing to buy a new set. After all, Odyssey, Journey and the vanilla Dixit all have enough cards to supplement a game for 12 people - the only thing lacking from the vanilla version are enough voting tokens/components for 12 people. Has components for 6 more players but it looks like these components may be the same colour as the original ones provided in vanilla Dixit. 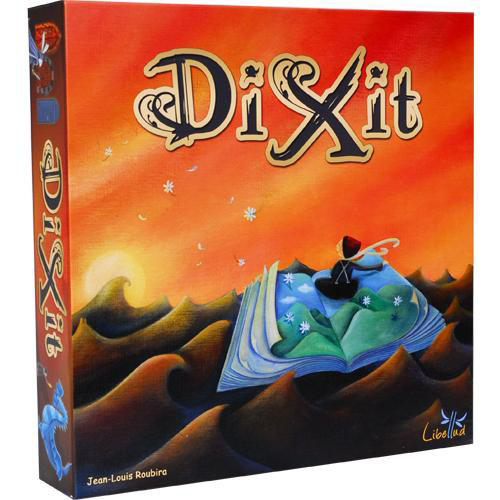 Dixit is extremely easy to play and can be quite likeable with the right people. It's a game designed to forge existing friendships, in the sense that familiarity with your friends' personalities and interests is somewhat advantageous (kind of like Say Anything). The problem with this game though is that some of the pictures are too random, abstract or just difficult to give subtle clues about without being too obvious. Furthermore, people can ruin the game by simply chucking in a card that completely doesn't match the clue given so as to make it easier for the guessers. My group didn't quite like this game, but some people enjoyed it. I enjoyed it, but wished I was more creative enough to play this game better. It works really well if you and your friends enjoy thinking of out-of-the-box methods of communicating or describing a picture, and seeing if others can deduce your clues. Inventiveness, familiarity with your friends and an understanding of how other people would interpret your clues is key, though I suppose each of these traits can be developed over a few plays with the same people. The game starts to get dry though if people are feeling uncreative or are otherwise too lazy to think of a unique way of describing something. Also, there is some degree of luck involved: much of it will depend on what cards your friends have in their hands - if theirs don't suit the storyteller's clue, the storyteller's card can become quite obvious. If you enjoy beautiful artwork and like the idea of giving vague descriptive clues about pictures (tricking some but enlightening others), whilst exercising your creative muscles, give this a shot. Score tokens are underneath, but they are fairly self-explanatory. 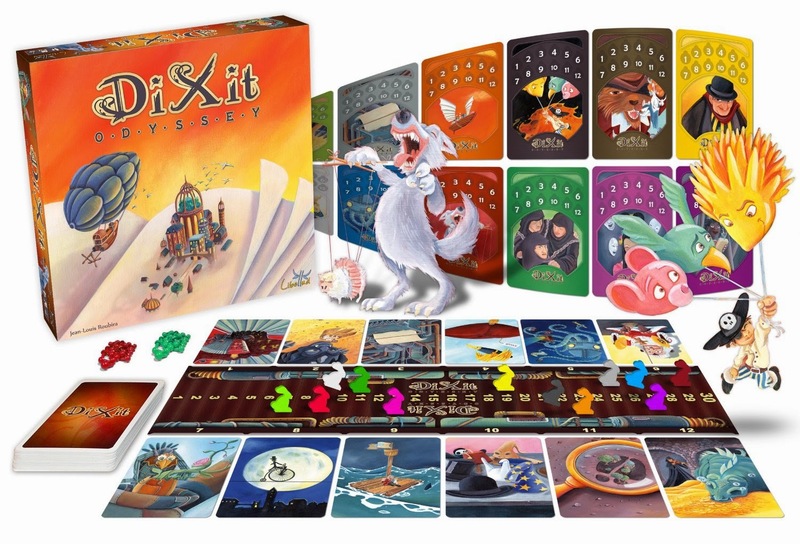 Another version of Dixit - the international second edition by Libellud - might have the scoretrack on the box itself. Each person receives as many voting tokens as there are players (so in a 5 player game, each player receives voting tokens of different colours 1 to 5). 6 cards are given to each player, the rest form a draw pile. Everyone takes a turn to be the "storyteller" or "clue-giver" (the game calls this person "the active player"). When you are the story-teller, you give everyone a clue and you can make it as vague or obvious as you like (at your own risk). The storyteller picks a card that best matches their clue and places it face down. Then everyone else picks a card from their hand that best matches the clue given and places it face down. (For a three player game, each player gives 2 cards). Then all cards are collected, shuffled then revealed, and placed on the board (which numbers them from 1 to 5). Each player then decides which picture was the clue-giver's card. They vote for which card they think belonged to the clue-giver by putting their votes face down. The votes are revealed and assigned to each picture. If all players guess the card correctly, the clue-giver gets zero points and everyone else gets 2 points. If no players guess the card correctly, the clue-giver gets zero points and everyone else gets 2 points. If people voted for a card that was not the clue-giver's, that player who owned that card that was voted for gets +1 bonus point for every vote on their card. If at least one player, but not all players have correctly guessed the clue-giver's card, the clue-giver gets 3 points and anyone else who found the card gets 3 points. People who got votes on their card, as above, get +1 bonus point per vote on their card. Hence the clue-giver wants, some, but not all people to guess their card. Victory: Whoever reaches 30 points wins. Alternatively, if the last card of the draw pile is drawn, the player with the most points at the end of the game wins. All cards here represent what players think is "lonely"
In this example, Red guessed the correct picture. Yellow and Blue guessed picture #2 which is wrong. Green guessed picture #4 which is also wrong. Therefore, the storyteller and Red get 3 points; whoever put picture 2 down gets 2 points (because Yellow and Blue voted for it) and whoever put picture 4 down gets 1 point (because Green voted for it). Each player that placed down a card gets to draw a new card and now someone else is the storyteller.